The Armeros missed out on a good opportunity to have picked up a result at La Rosaleda. 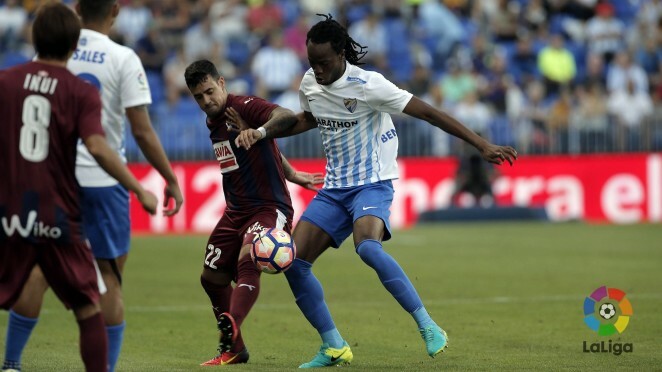 Eibar passed up a fine opportunity to have collected some points at La Rosaleda, after being the better side in the first half but then allowing Málaga to get back in the game after the break. The Armeros were utterly dominant in the opening 45 minutes, and whilst they enjoyed relatively few clear-cut openings, the visitors got their noses in front courtesy of Nano Mesa's 41st-minute debut goal. The Canary Islander met Inui's cross from the left only for his headed effort to be parried by Carlos Kameni, but the forward was on hand to blast home the rebound from within the six-yard box to put Eibar into the ascendancy. It appeared as if the visitors would then go on to claim victory, with the Andalusians looking vulnerable and hesitant, but the hosts' were spurred on by Sandro's goal just a minute before the interval. After the restart, Málaga enjoyed greater possession and fashioned more chances, as the Armeros lacked the sharpness they'd shown in the opening half. In spite of this, José Luis Mendilibar's men barely afforded Málaga any sights of goal, and as the clock ticked down, it looked very much as if the game would end all square. However, with 15 minutes to go, Youssef En-Nesyri, who had only recently entered the fray, drove down the right, before unleashing a perfectly-placed left-footed strike which flew past the helpless Asier Riesgo. Eibar poured forward in the final minutes and carved out some chances to have struck an equaliser, including a Gonzalo Escalante volley which flew narrowly past the upright. The Armeros will be disappointed after succumbing to defeat in a game in which they dictated proceedings in the first half and on a night on which they deserved better fortune all round. Ignacio Iglesias Villanueva awarded Sandro (56'), Camacho (66') from Málaga CF y Florian Lejeune (29'), Fran Rico (39'), Escalante (89'), M. M. Dos Santos (90+2') from SD Eibar.